MITSUI-SOKO Group provides Door-to-Door transport service by issuing a Combined Transport Bill of Lading (CT B/L). Under this service, our customers reap a double benefit in having access to discounted rates without the risk of having to commit to a carrier contract. From International forwarding via any mode of transport to Just-In-Time local delivery service, MITSUI-SOKO has demonstrated its commitment to excellence with decades of successful experience in coordinating the global brokerage needs of major multi-national corporations around the world. 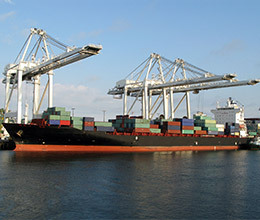 MITSUI-SOKO’s Multi-modal Transportation Service (Sea, Air, Rail & Truck) offers a seamless, integrated customized package of transport services precisely geared to handle the time-critical and complex task of moving shipments through Customs and beyond to the final consignee as quickly and efficiently as possible.